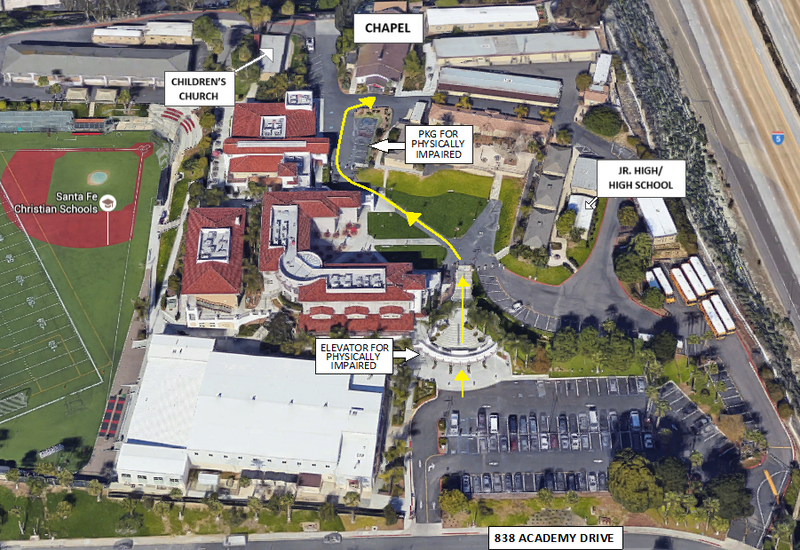 We meet at 10am on Sunday Mornings in the Chapel on the campus of Santa Fe Christian Schools in Solana Beach, CA. We have child care for 0-Preschool, Children's Church for K-5th grade, and Youth Sunday School for 6th-12th grade. From the North, take Highway 5 to the Lomas Santa Fe Road exit in Solana Beach. Turn right (west) onto it. Go to the second traffic light and turn left onto Stevens. Go to the second traffic light and turn left onto Academy. The church is located on the Santa Fe Christian Schools grounds. From the South, take Highway 5 to the Lomas Santa Fe Road exit in Solana Beach. Turn left (west) and go under the highway. Go to the third traffic light and turn left onto Stevens. Go to the second traffic light and turn left onto Academy. The church is located on the Santa Fe Christian Schools grounds.